It's hard to know why things happen in our lives. We ask "Why?" a lot. We try to figure out a reason for the things life throws at us. Sometimes we learn why, and we can use our experience to help others who will go through the same things. Sometimes we never learn why. And again, I ask, "Why did that happen if that's all there is to it?" It seems like things should have a greater purpose than just to make me endure it. Will it make me a stronger person because I experienced it? When we're not sure "Why," we can rest assured that God's hand is in it. But it's hard to see how God could allow us and the ones we love to suffer. What is that all about? I don't know. But even in the midst of suffering we can lean on God and rest in Him. Praises! We are safe! God protects us and holds us close when we need Him! And let's not forget the future glory that we know is coming when all of us will be made whole and no more tears of sadness or pain will be shed. I DID IT! 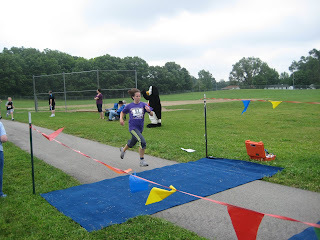 I ran not just one 5K, but 2 5Ks, back-to-back! I took a short 5 minute break between and then got back to business. And I set the pace of my second race faster than the pace of the first one. YES! I broke perceived boundaries and pushed my limits. I am highly motivated by a new direction in my life and a renewed passion for health and fitness. More to come on that . . . Meanwhile, Finn and Meadowe continue to be the smartest kids I know. Sometimes Ora and I look at each other after a comment made by one of them and we wonder how in the world they came up with the things they do! Meadowe told a knock knock joke the other day, "Knock! Knock!" "Who's there?" "Eh." "Eh, who?" "Eh, I've been knocking so long my hand hurts!" I don't know if she came up with it, but that she remembered it and told a good joke put a smile on my face for the afternoon. Meadowe has also been praying for dinner these last few nights. She is a very thankful child. Tonight went like this, "Dear God, thank you for today. Thank you for Leah and Brendan. Thank you for this food that Mommy made. Thank you for Finn. Thank you for Daddy. Thank you for Mommy. And thank you for Murray. Inyernamewepray, and everybody said, AMEN!" Finn tried to pray, "God?" And then he didn't want to do it anymore. But he loves to say, "AMEN!!!!" I think because he knows that the sooner and faster we say it, the sooner and faster we get to eat! And if you didn't know, that's his favorite thing to do. Eat. The boy is a munching, grazing machine! Every time I turn around it seems like he's asking for food. I feed him good food, I do, but it's the in between times that he wants more, more, more! I just learned that a 5K some friends and I have been preparing for is about 12 weeks away! Yes! Can't wait! Another 3+ weeks have gone by and I can't seem to get up on here once a week, let alone every day or few days as I mentioned a while back. What up? I'm sure I'm losing readership! Thanks to Michelle for pointing out that I haven't added anything lately and am very far behind. Guilty as charged! So, I've had a lot of thoughts rattling around in my brain lately. This accounts for my absence. So, do you ever have those times in your life when you feel like you're at a crossroads or a fork in the road and it makes you stop. And think. And question, "What next?" "Which path shall I choose?" "Where do I go from here?" Because we know that once a path is chosen or a turn has been made, we can't go back if it doesn't work out the way we thought or hoped it might. For whatever reasons, I don't like this "standing still." I'd rather be going somewhere. Not sure why I feel that way, but standing and waiting is very uncomfortable. Perhaps because it forces us to confront our fears and nightmares, hopes and dreams. It forces us to deal with that which is right in front of us instead of just passing it by and hoping it goes away and doesn't come back. Kinda like sweeping it under the rug: you can't see it anymore, but when the rug gets moved, that dirt and dust is there staring you in the face. What do you do? Do you put the rug back in place, or sweep up the dirt & dust and deal with it properly? I suppose that depends what the problem is, and how much it keeps creeping out from under the rug. But regardless of whether we sweep stuff under the rug, or put blinders on as we walk our path of life, at some point, IT must be dealt with. Answers come in various forms at the most unsuspecting of times. Maybe it feels like the answers don't come. I think that can also be a form of an answer. Life can be mysterious at times. And the mysteries present more questions. I don't have special insight or else I'd have my own stuff figured out, but I do know that we have been given guidance. "Your word is a lamp to my FEET and a light for my PATH." Psalm 119:105. The light shines just where we need it most: right in front of us. Not down the way or around the bend or over the hill, but right at our feet so we know where to place our feet. One step at a time will get us through life and to life everlasting. Even standing still we can know that our first step will be a sure one when the light illuminates it. And while we wait for the direction we must remain focused on the One who guides us. It is these times of waiting when the devil will try to sneak in and plant false hopes and thoughts, deceiving us. " . . . Your enemy the devil prowls around like a roaring lion looking for someone to devour." 1 Peter 5:8 But we can pray, "Search me, O God, and know my heart; test me and know my anxious thoughts." Psalm 139:23. "Do not be anxious about anything, but in everything, by prayer and petition, with thanksgiving, present your requests to God. And the peace of God, which transcends all understanding, will guard your hearts and your minds in Christ Jesus. Finally, brothers, whatever is true, noble, right, pure, lovely, admirable--if anything is excellent or praiseworthy--think about such things." Philippians 4:6-8. What?! With 'thanksgiving'? How am I supposed to be thankful for the anguish and pain I'm feeling? But it is God's peace that our earthly minds cannot comprehend that helps us find peace and calm in the whirlwind. "Be joyful always; pray continually; give thanks in all circumstances, for this is God's will for you in Christ Jesus." 1 Thes. 5:16-18. OH, there's that "thanks" word again! Give thanks for the hurt? How? I certainly don't understand it, but it's reassuring to know that God's promises are there for ME, and for YOU. If I've only provided more questions and confusion for you than answers, I didn't mean to, and I'm sorry. I hope that this might be the catalyst for you to begin your own journey to peace and calm out of chaos and frustration. "Cast all your anxiety on him because he cares for you." 1 Peter 5:7. And when we find ourselves moving again, and there is peace in the movement, rest assured that your trials were not in vain. "And the God of all grace, who called you to his eternal glory in Christ, after you have suffered a little while, will himself RESTORE you and make you STRONG, FIRM, and STEADFAST. To him be the power for ever and ever. Amen." 1 Peter 5:10-11.